Splashing Into Summer with Your Pup! | Life... Out Loud! I’m coming at you with another great product review from my friends at chewy.com… The place where pet lovers shop! They were all kinds of amazing this month and in addition to Bella’s dental chews they threw in a surprise prezzy… Um, hello and thank you for knowing how to make my heart happy! I am kind of a freak when it comes to what I allow to go in my pup’s belly and Natural Balance has been on the list of “yes please, immediately” for years! Natural Balance started in Burbank, Cali-for-ni-a in 1989. My dear Dicky Van Patten created an absolute winner when he dreamed up foods that were scientifically sound and nutritionally full of truth. Coming from a background like this it’s no wonder that the Sweet Potato & Chicken with Mango Dental Treats kept Bella McGoo begging (literally, she was begging) for more. Who trained this dog anyway!? I digress. 99 problems and her teeth are one of them… Serious. There are grooves molded into the treat to help assist in reducing plaque and tartar and the formula is easily chewed and digested. It freshens her stinky dog breath and delivers nutrients to keep her immune system on the up and up. 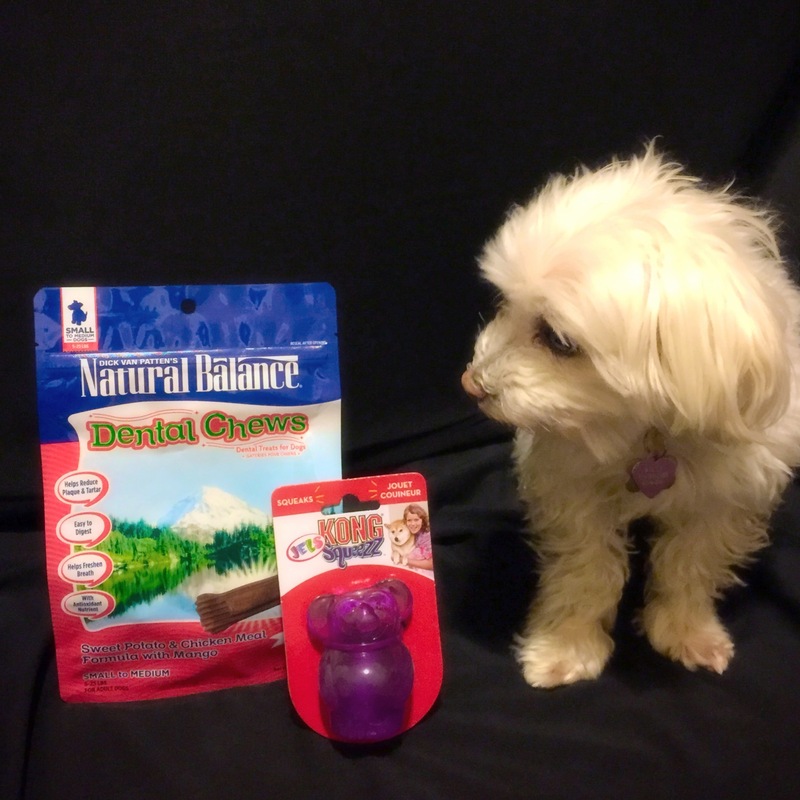 Check them out today- your pup will thank you… And then you will thank Natural Instinct and Chewy.com because your pups stinky breath will get a little less, well, stinky! If you are at all familiar with dog toys you will probably have heard of The KONG. It’s basically an indestructible chew toy. They have since branched out from that rockin’ red one. The KONG Squeezz JELS Koala Toy definitely got Bella’s attention! I squeaked it once and she looked out the window, twice and she looked at me, three times and she came sunning to investigate! It’s fun animal shape allows for crazy bounces that you don’t get from a ball. The toy a bit on the heavy side and kind of bulky for her little frame and mouth to carry around but for a dog bigger than 5lbs, I am sure they would love a game of fetch! All in all, this squeaker is a Winner with a capital “W”!